Learning from Life: What a wonderful Weekend in California! What a wonderful Weekend in California! I just flew home tonight from California. I was there to speak at a Women's Conference and celebrate my belated Birthday with some dear friends. It was a wonderful experience, I feel blessed that I had the opportunity to fly in and be a part of the Conference. I am always humbled by the chance I have to meet so many incredible women, to learn about their lives and to hopefully help and support them in some small way. What a WONERFUL weekend! Thank you to all of you who touched my life too! Then on the way home, I saw an old friend of mine on the plane and we got to sit together. It had been a few years since we connected, so it was great. She isn't old (you know what I mean ) but we have been friends for a long time. She looked as beautiful as ever (inside and out ), it was fun catching up with her and lucky for us, we were able to give her a ride home and have even a little more time with her. This was a perfect ending for a perfect weekend! Some of the ladies from the Conference, asked if I would put my talk on my blog tonight and so here it is. 16 years ago I fractured my back in two places and herniated 2 discs. I was in a wheelchair for a year and the only up time I had was going to Physical Therapy. Near the end of that year, my Physical Therapist asked me if I knew how to swim, I said sorta...I can dog paddle. No he said, I need to do swim like the crawl stroke " I then asked if that meant my face needed to be down in the water? " His reply "Yes, that is the only way that you can get your back and core strong" I knew after my core was weak after having 4 C-sections Swimming was probably the only sport that would get me exercise and strength without hurting my joints and so..... I went to the pool. I forgot to mention to the therapist that I almost drowned in an over crowed public pool when I was in Jr High. Still I knew I probably didn't have much of a choice so.... I decided that I would Aqua Jog . With Aqua jogging you put a floatation belt around your waist and you just run underwater ( in the deep end of course). So there I was every day aqua jogging and watching all the swimmers. I studied everything there was about them, what position their hand was in when it entered the water, how many strokes did they do before they turned to swim? I asked what the different strokes were called. How many strokes they did before they took a breath? Do you turn and breath or both sides or just one? Yes, every day I watched intently to see what I was going to have to do to become a swimmer some day. One day I came home and asked Jeff if he could get me a SWIM CAP ( I wasn't driving at this point yet )? His response was " I thought you didn't put your head under the water because you are aqua jogging? Well I said, if I am going to be a swimmer some day, I am going to have to have a Swim Cap, all the swimmers have them. Plus the Swim Cap keeps your hair out of your face when you swim and protects your hair from turning GREEN. And so he got me a Swim Cap. Proudly I wore my new Swim Cap the next morning as I aqua jogged and continued to study the swimmers. A month or so later, I asked Jeff when he picked me up from the pool, if he would buy me some Goggles? Again he gave me that same questionable look and said " Now Lynn, why do you need Goggles, if you never put your head down in the water? Well, Jeff everyone wears them, they have them sitting right here on top of your head, and if I am going to be a swimmer some day, then I am going to have to have Goggles. Plus, the goggles do help you see under the water and helps you to swim straight so you don't wonder over into another swimmers lane, and they protect your eyes from all the chlorine. Thank goodness he had pity on me and got me some Goggles. So you see I looked like a swimmer much sooner than I became one. I don't remember the time line exactly, but I continued like that for quite some time. Someone asked me once, why I didn't take lessons simply put, my medical bills were causing our money to be tight enough. And so I continued to jog and observe. Finally the day came where I thought I would try and swim. I put my goggles over my eyes and tried to do the crawl stroke, face down in the water. I was scared to death but I shouldn't have been... because I left on the Aqua Jogging Belt, so there was no way that I was going to drown. I swam like that until I felt like maybe I could do it myself ( I won't tell you how many months that was ). When I actually took the belt off, I was shocked at how much breath it takes to swim just one lap. Not sure that my lungs could take it, and worse is that when I got almost to the end of the pool ( which is the deepest part) I would look down (through my nice goggles ) and realize that I might not make it. It seemed that my body was not straight and aligned in the water like the other swimmers. I felt like I was swimming this way at an angle and that my legs were just too heavy. I thought maybe it's because my calves are so big? Everyone always teased me about them all my life, maybe that was it. Then I thought well there are others swimmers who had calves bigger than mine ( ok, well there was at least one man who had calves bigger than mine but still...he could swim just fine. So I got on the computer and looked up what swimmers did that had trouble with keeping their legs up and level with their bodies. I found that one thing you could do was to use training flippers ...they were called Zoomers. I wanted to them immediately, if it could help me get to one end of the pool to the other a little faster and more efficient .. I was all for that. And so Jeff bought me.....Zoomers and they worked...I swam a bit faster, with much more efficient kicks and it helped also strengthen my lower back and my core. A year from my pool experience, I began to swim a mile a day. I did that for almost 3 years and then I fell and hurt my neck. That was many years ago and I never got back to the pool again. Then after having a car accident this past December my Physical Therapist ( who was different than I had before ) suggested that I learn to swim. I was nice and didn't go into the whole story of what I accomplished so many years ago. You guessed it, I knew I didn't have any choice, so I bought all of those 3 important items AGAIN and also purchased a swimming prosthetic. This time getting in the pool was not only painful because it had been so many years and my body had changed in so many ways since my surgery and my age ... My youngest daughter Lauren is home right now from college doing her internship and she is a swimmer. So for the first week she came with me for moral support and promised that she would swim down and get my prosthetic if by chance it fell out. Now the money for a special suit was very expensive so I just decided to use it in my regular suit, they are tight any way so it would probably stay. However after the first lap, I found my prosthetic down near my belly button, so I went and got a new suit, so far so good. It has only been a month now but it feels good to be back in the water and exercising again! Now you are probably wondering what swimming has to do with anything that we are talking about today? Well, remember that I told you that I watched and studied swimmers every day because that is what I wanted to become right? That is also true in my life as a Mom, Wife, Sister and Friend. Since I was a little girl, I have always admired, looked up to and wanted to be like so many people in life, particularly those in the world who are Happy, Overcomers, Survivors, Helpers, those people who are half full and ones that have such great JOY in their lives even though life has thrown them many tough situations. I have my whole life studied, observed, watched and tried to see what makes these people the way they are. "Extraordinary people survive under the most terrible circumstances and they become more extraordinary because of it"
Where do you find these people? Well, they are everywhere. We can read about them in the news, we can read about them in the scriptures, we know people in our family or in our neighborhoods. Probably many of you in this room are already like that. There are a whole lot of them out there and so if we really want to be like them...we need to put forth the effort to see what makes them do what they do? That is my ultimate goal in life...to be a Helper. So what is that these people have that bring them this joy. It is a Secret? Many people have spent their whole life looking for it The Secret of Life, others have spent $1000s of dollars trying to obtain it and yet others have sacrificed thing of great importance just to find it. I certainly don't think it is a secret. I think the Lord has told us over and over again how to find it. I believe it comes down to 3 things that these type of people have, maybe in varying degrees but I would say that most of them have these 3 things, and because they have them, then they have JOY, the type of joy that everyone wishes they had. So let's talk about what these 3 things are. God is our Heavenly Father, and we are His literal children. He and His Beloved Son want us to be happy and eventually come to a fullness of Joy. So, is it possible to strengthen our faith and deepen our testimony to the point that we can endure whatever life holds in store for us and come out stronger than before? As a young missionary ( some 30 or so years ago ) I remembered one of my favorite things to teach others about our church was The Plan of Salvation, it was in this lesson that we taught them the answers to the questions Where did I come from? Why am I here ? And where am I going after this life? When they truly understood these answers, and when they prayed and found out through the Spirit of the Lord, that it was true. Once they obtained that testimony by the spirit, their lives began to change for the better. A great example of this, was story of Amanda Barnes Smith during a time of persecution and suffering of the Saints at Haun's Mill. “… ‘Oh, my Heavenly Father,’ I cried, ‘what shall I do? Thou seest my poor wounded boy and knowest my inexperience. Oh, Heavenly Father direct me what to do!’ And then I was directed as by a voice speaking to me. “So Alma lay on his face for five weeks, until he was entirely recovered—a flexible gristle having grown in place of the missing joint and socket. I have always wanted and strived to have that same type of faith that Amanda had, as a Mother, I felt like I needed that to be able to help and support and teach my children. During my battle with cancer ( both times ) I prayed and strived to have my faith strong. I wanted my kids to know that I knew my Heavenly Father would make me equal to whatever trial He gave me. I wanted them to know that I had trust in Him and that we as a family could come out stronger and better because of it. "WE ARE NOT MORTAL BEINGS HAVING SPIRITUAL EXPERIENCES. WE ARE SPIRITUAL BEINGS HAVING MORTAL EXPERIENCES" When I think of it that way, then it makes more sense. If you believe that you are a child of God, that He is literally our Heavenly Father who loves us, then we can know that everything that happens...happens for a reason. Some of the greatest lessons I have learned in my life...have come from some of the hardest things I ever had to do; and many times after waiting for what seemed a long time before I understood their meaning or purpose. My earliest memory was at the age of 5, and I remember with such clarity being abused by my grandfather.The physical abuse continued until I was 11 years old, the verbal and emotional abuse went on until I was married and moved away. I have spoken many times on this blog about being a Survivor, and what that means...in hopes that anyone else out there who has been abused will realize it is not their fault and that they too can survive horrible and tragic experiences. Better than that, they can some day be happy, strong and a better person because what they have overcome. One day a teenaged boy went into a Candy store. He approached the Proprietor and asked for 3 boxes of chocolates 1 one-pound of chocolates, 1 two-pound box of chocolates, and 1 three-pound box of chocolates. The owner complied and began to fill the young man’s order and asked, “may I ask you why need 3 boxes of chocolates”? “I am going to a dance with a girl that I don’t know very well but I like her a lot. If we go to the dance and she is shy and quite, and perhaps we dance a few dances I will give her that 1-pound box of chocolates. If we go to the dance and she is fun and we dance a lot and she holds my hand, I will give here that 2-pound box of chocolates. If we go to the dance and we dance close all night long, hold hands and as the end of the night she gives me a kiss, I will give her the 3-pound box of chocolates. The owner smiled, wished him good luck and rang the young man up for his order. The night of the dance arrived and the young man went to the house to retrieve his date for the evening. Her parents invited him inside and they waited for her to come downstairs. When she was finally ready she came down and said she was ready to leave. “Do you mind if we read some scriptures together with your parents before we go”? She thought this was a strange request but allowed it. After completing some verses she again resounded she was ready to leave. “Before we go can we kneel down together and have a family prayer”? She again thought this to be strange but figured it would help her to get to the dance so she allowed it. After the prayer she asked the young man again if they could leave, and he finally agreed. They said goodbye to the parents and left. “To be honest… I had no idea your father owned a Candy Store”. "A change in understanding can lead to a change in behavior"
FAITH PROCEEDS HOPE, AND OPTIMISM IS THE OUTGROWTH OF HOPE!" But Why Then Is There Despair? The scriptures say that there must be “an opposition in all things. The adversary uses despair to bind hearts and minds in suffocating darkness. Despair drains from us all that is vibrant and joyful and leaves behind the empty remnants of what life was meant to be. Despair kills ambition, advances sickness, pollutes the soul, and deadens the heart. Despair can seem like a staircase that leads only and forever downward. Hope, on the other hand, is like the beam of sunlight rising up and above the horizon of our present circumstances. It pierces the darkness with a brilliant dawn. It encourages and inspires us to place our trust in God. Hope is not knowledge, but rather the abiding trust that the Lord will fulfill His promise to us. It is believing and expecting that our prayers will be answered. It is manifest in confidence, optimism, enthusiasm, and patient perseverance. The things we hope in sustain us during our daily walk. They uphold us through trials, temptations, and sorrow. Everyone has experienced discouragement and difficulty. Indeed, there are times when the darkness may seem unbearable. It is in these times divine principles we hope in can uphold us and carry us until, once again, we walk in the light. and the map to move by. a thousand paths and infinity of dreams. Hopeless, we are lost forever. Hope is one of the prime differences between successful people and those who can only see failure. Successful people have hope because they can clearly see their goals. People who only see failure have no hope because they see no light, they set no goals, and they see nothing accomplished. Successful people see alternatives and are willing to try different ways. People who only see failure are unable to see another way and give up to easily. With hope you are halfway to where you want to go; by setting your goals, and taking the action to achieve them, you will see your hope turn into your reality! "Man can live forty days without food, about three days without water, about eight minutes without air, but only for one second without hope"
I love the story in the book of John, chapter 5 verses 1-9. In Jerusalem there by the sheep market was a pool which was called (in the Hebrew language) Bethesda. This pool (like a hot springs or mineral springs) was known for it's healing powers at certain times. When the water was moving( troubled ), then the first person who got in, was to be made whole from their disease. Great multitudes of people with various problems waited by the pool, to be the first one in. The story goes on to tell about a invalid man who lived in Jerusalem and had suffered with his disease for 38 years. Jesus saw him at the pool and knowing he had been in that condition for a long time said unto him "Wilt thou be made whole?" The impotent man answered him, 'Sir, I have no man, when the water is troubled, to put me into the pool; but while I am coming, another steppeth down before me' Jesus saith to him 'Rise, take up thy bed, and walk'. And immediately the man was made whole, and took up his bed, and walked. 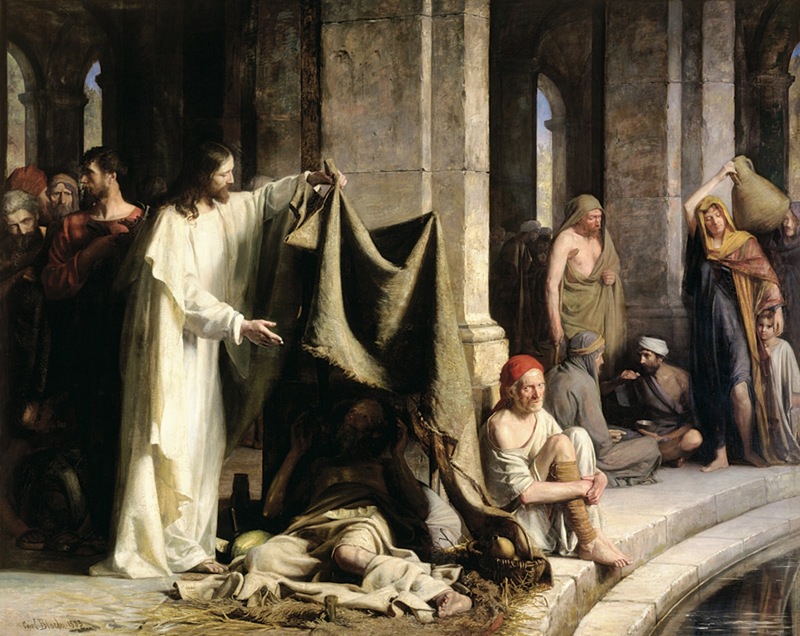 I guess the obvious moral of the story is that with the Savior's help there were many miracles that happened on a daily basis, but I also thought about what this man must have felt like. Everyone was pushing and walking over or ahead of him to help themselves. How many times do we rush by in life and not see, someone who is in need of help. That takes time and patience. That takes really looking outside of ourselves. It was a wonderful story and once again the Savior's example was a perfect lesson for us all ...to slow down and personally get involved with other people's lives. It not only will bless them, but our lives will be better too. Service does that to you! I have heard my whole life that if you are hurting, frustrated or depressed...the best thing you can do is serve someone else. In doing so we forget (for maybe only a minute or so) our problems, pains and frustrations. It gives us a clearer view on life and it's true meaning. Christ asks us to give of ourselves, to help lift others around us, share with those in need, to strengthen and gladden, to help them come unto Him. If we do so then we can truly be called disciples of Christ. Sisters I promise you that if you just give a smile to someone in need, a hug to someone who is suffering, a card to someone who is lonely and even a pray to those in need...that there is where the miracle of service comes in. That is where we can make a difference in other's lives and in our own lives. 14. And now behold I ask of you my brethren ( and I would add Sisters) of the church, have you spiritually been born of God? Have ye received his image in your countenances? Have ye experienced this might change in your hearts? 15. Do ye exercise faith in the redemption of him who created you? Do you look forward with an eye of faith, to stand before God to be judged according to the deeds which have been done in the mortal body? 16. I say unto you, can you imagine to yourselves that ye hear the voice of the Lord saying unto you, in that day . Come unto me ye blessed, for behold, your works have been the works of righteousness upon the face of the earth? 11 These things I have spoken unto you, that my joy might remain in you, and that your joy might be full. 12 This is my commandment, that you love one another, as I have loved you! Is the service you've given mankind. " Sisters, I pray that if we do these 3 things, that we will find the JOY that comes with, loving and serving others as the Savior did. I promise you that your Heavenly Father knows you individually and He will always be there for you. He loves you, and wants to help you. But it is important not to let fear and despair keep you from getting the help that you need. I know these things to be true and I so grateful for the opportunity to be here and share them with you. It was wonderful to see and hear you on Saturday. I sure hope it won't be another 7 years till we can sit down and talk face to face. Hope you are clicking away those happy thoughts! A Father's love and commitment! 2 Day Sleep Over with Miss Jenny!